We are open 7 days a week from 12 noon to 10 pm. Last orders: food 9 pm, drinks 9:45 pm. The Lobster Pod is a bistro situated overlooking the harbour and beach. It has spectacular views across Bigbury Bay and both indoor and outdoor seating. Our three bookable pods have got heaters and sound system to help you enjoy winter weather while trying our food. We specialize in lobsters (waiting for you in our tank - they can not be fresher) and steamed fish both locally caught. We also do pizzas, conebakes,fish chowder and vegetable soup and home-made desserts. Great food, great service, great atmosphere, great location. Can’t recommend the Lobster Pods enough. We had a fantastic visit and really enjoyed the food at the lobster pod. The service was excellent. Fabulous experience, best calamari I have ever had, lobster was delicious, the waitress such a lovely girl, very helpful. What a view! Thank you we will be back!! Had a lovely meal here for my mums birthday. Service was amazing and the food was fantastic! Thank you! Fabulous spot with great service and all at a reasonable cost. Recommended. The gentleman who served us was very polite and helpful! Really made the experience! A lovely setting, we had eaten elsewhere so just had dessert & drinks in the pod. Very friendly staff. Great atmosphere. Really great place to eat in Hope Cove. Food was lovely and staff very pleasant. There were 9 of us in a pod and plenty of room. My only suggestion would be that larger parties are given longer than the 1hr 45 mins booking slot as we were chucked out of our pod before we could even order our desserts. We finished our drinks on a table outside but do feel that for 3 courses it was all rather rushed. Only pick up  would be the limited menu but was aware before so was happy. What should have been a brilliant evening was one of frustration and disappointment. I don't write many reviews but I feel compelled to write this one. 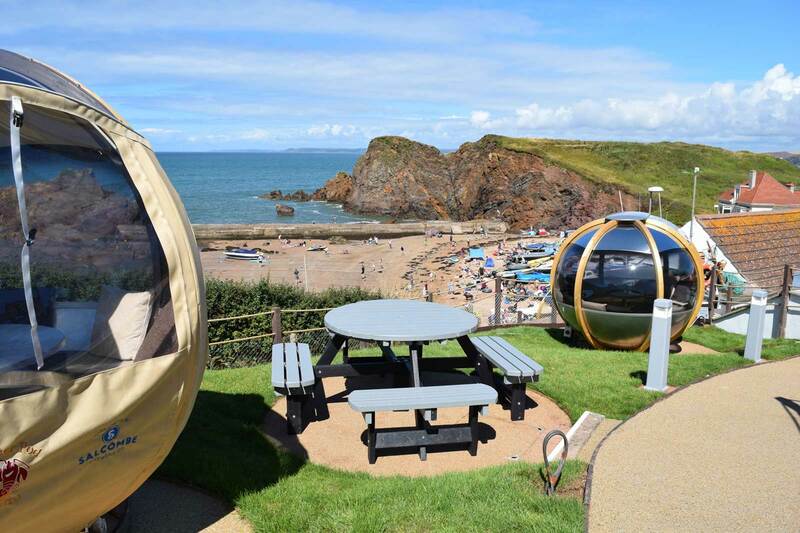 It so easily could have been a 5 Star review as the location is amazing and the concept of the pods is great. Alas the complete lack of service and grumpy staff (blonde waitress) killed it dead. 1) We arrived and waited at the bar until we were noticed - about 5 mins. 2) We were told "Pod 11 top of hill" and menus thrust into our hands. Rather than the expected " Follow me please and I will show you the way". 3) We were then left alone for over 30 mins before our thirst and hunger got the better of us and we picked up the ordering phone in the pod but no one answered. So I went back to the bar to ask for a drink. I was then left standing there. I had to go and track down a waitress who said she'd come to the Pod to take the order. There was no chance I was going to wait so I followed her back to the bar and placed the drinks and food order. She then disappeared leaving me waiting again. I returned to the Pod drink-less. It was now 45 mins since arriving. 4) Everyone was getting grumpy now (not just the staff). 50 mins passed so I went back down to the bar and finally found our drinks waiting. I took the tray up to the Pod myself. 3 Drinks and one was a sparkling water - no glass provided! Is this McDonalds? 5) After an hour of waiting the food arrived. A rather shambolic entry - food came first 4 mins ahead of any cutlery. Chips served in the smallest bowl and Potted Crab in a small ramekin with some sticks of celery and carrots more suitable for a kids party! 6) The food tasted nice but the fish were full of bones and made eating the platter difficult. 7) Eventually someone came and asked if we were ok. This was now more than 1hr 30mins after we'd arrived and the first time anyone paid us any attention. No question of "would you like another drink". 8) After what felt like a lifetime we traipsed back to the bar to pay the bill. We got a £10 discount on the bill but left feeling let down. It wasn't busy so that is no excuse. It was a huge disappointment. We went expecting a great night but left grumpy. The issues seem easy to fix and I hope you can do this as you have a great location and concept but let down by awful service and a complete lack of attention to detail. Staff were really helpful & friendly & the view & ambience speaks for itself! The food was a little bit disappointing especially the kids pizzas-very small for the price, compared to other kids menu pizzas in other local restaurants. They seem very similar to the very cheap mini pizzas from supermarkets??? Not worth £6 each!! Service was a bit slow for our desserts BUT this was a minor hassle for what was a sensational eating and relational experience with our whole family. Thank you. Views just gorgeous, food excellent, conversation brilliant - what more can anyone want? On the day of our booking, the most wanted items on the menu (the hot conebakes) were not available. The two vegatarians opted for the veggie platter, only to be told that the main item on the platter was also unavailable. However, despite these setbacks, we had a good lunch, and the veggie platter was topped up with a huge amount of the other items to make up for the lack of veggie tarts. We had a lovely time at the Libster Pod to celebrate mother’s Day. Beautiful views, lovely atmosphere and fantastic food, all reasonably priced. Made my sister-in-laws birthday surprise amazing. The service was second to none. Totally original idea having dinner in a pod. Fantastic. Watched the sunset; what more could you ask for. Staff couldn't do enough to please. We live locally, so will most definitely be back. 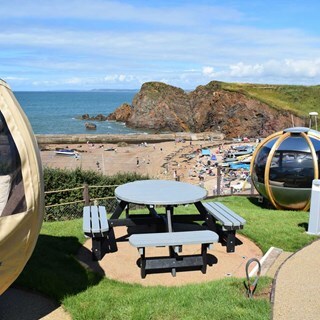 An amazing unique bistro pods with breathtaking views, yummy food and lovely hardworking staff. We Highly recommend this place as there’s nothing like it in the area - you can even connect via Bluetooth and play your own music while having drink/lunch! Just fantastic and must-do experience :) we will be back!